Every year, users perform trillions of searches and, still, 15% of queries have never been searched. Many searches are old favorites that are asked nearly every day. The same is true at our Google AdWords trainings, where FAQs dominate Q&A. People tend to struggle with similar obstacles year after year, whether it be match type or account settings. Somewhere just beyond Michael’s top 5 common PPC questions is linking Google Analytics and Google Search Console accounts to AdWords, a question that we hear at most AdWords training sessions. Linking your Google products together helps to provide context to your data, allowing you to draw deeper insights and hopefully, make more accurate conclusions! This post offers a step-by-step troubleshooting guide, complete with how-tos and screenshots. Before we begin, please verify email addresses and access levels. Use the following screenshots to ensure that you hold the right permissions. You will need administrative access at the account level in AdWords. Step 1: In AdWords, go to the wrench icon in the top right corner menu. Step 2: Verify that your email is listed with Admin level access. If you don’t have access, get it touch with someone who can change it. You will need Edit access at the Property level in Analytics to link your accounts. Step 1: In Google Analytics, find the Property and View you want to verify your access. Step 2: Click on the gear icon at the bottom of the left sidebar to open the admin panel. Step 3: Under the Property column, click User Management. If you don’t see it, you don’t have the proper permissions. Step 4: In the Permissions column, look for the Edit permission for the email address associated with your AdWords account. The goal in this section is to share information between accounts so (1) AdWords data can be used in Analytics and (2) Analytics data can be used in AdWords. Step 1: Go to Google Analytics and choose your Account and Property. in the bottom left of the sidebar. Step 3: Under the Property column, click AdWords Linking. 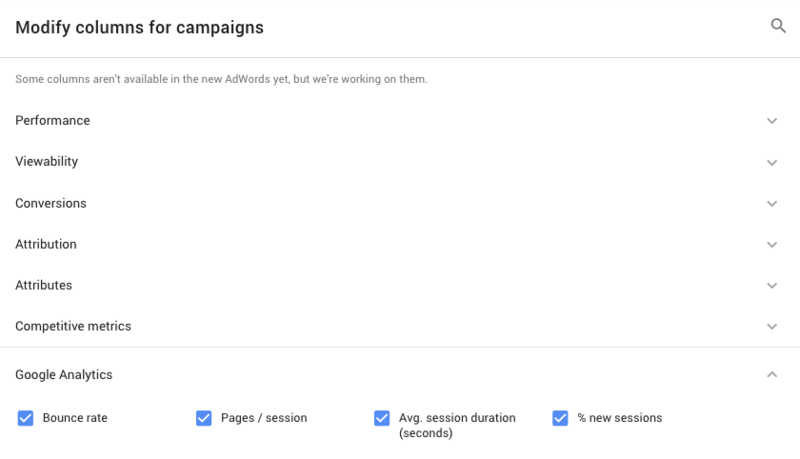 Step 4: Choose your preferred AdWords Account and click Link Configuration to name your link group and choose the views you want to see AdWords data in. Step 1: Go to AdWords and click on the wrench icon in the top right corner navigation. Then, under Setup, click Linked Accounts. Step 2: Find the Google Analytics option and click Details. Step 3: Find your Google Analytics property and click the Link button under the Actions Column. Step 4: To see your Google Analytics data in AdWords, go to the Campaign, Ad Group or Keyword section and click on the Columns dropdown (three vertical bars), then choose Modify Columns. Choose Google Analytics from the options and click check the metrics you want to add. Don’t forget to save! If all dots were connected correctly, you should have an email in your inbox to acknowledge that your work here is done. A link between these accounts provides broader search data to AdWords, allowing marketers to compare the relationship between organic and paid search efforts. Stephen wrote a nice overview here on how to use the Paid & Organic Report. Step 1: Go to AdWords and click the wrench icon in the top right navigation. Then choose Linked Accounts. Step 2: Find Search Console and click Details. Step 4: Enter your site in the URL field and click continue. AdWords will check that you have the proper permissions. It will then send a request to the webmaster to link the accounts. For even more on the Paid & Organic Report, see Google’s guide.